From the 5th of July 2017 the Musée des Arts Décoratifs (Paris, France) is hosting a unique retrospective exhibition dedicated to the 70’s anniversary of the House of Dior. The exhibition reveals not only the ten years of Christian Dior’s creative activities but also the creations of six artistic directors that followed Dior: Yves Saint Laurent, Marc Bohan, Gianfranco Ferré, John Galliano, Raf Simons and Maria Grazia Chiuri. The exhibition presents around fifteen models by each of Dior’s six successors in a series of six galleries organized in chronological and thematic order. The aim is to show a heritage and reveal the richness of Dior’s creative universe. Alongside the three hundred dresses, the exhibition gathered together also numerous documents (sketches, photographs, manuscripts and advertisements) and objects (hats, jewellery, shoes, perfumes), as well as sets of paintings and pieces of furniture from the eighteenth century to Art Nouveau and Surrealism. The exhibition includes also the miniature version of iconic Dior gowns created by the House of Dior in 2013. Dior’s first collection named “New Look” was presented in February 1947. The successful collection determined the direction of fashion for the 1950s. Nostalgic and elegant style of the “New Look” was characterized by rounded shoulders, a high and emphasized bust, a tiny waist and bouffant skirt, gloves, a hat and high-heeles shoes. A “New Look” dress required dozens of meter of fabric. For women, who had been forced to dress in a simple manner during the Occupation, this luxurious use of material was a confirmation of the fact that the war was over. To enhance his couture creations, right from the start of his fashion house, Christian Dior highlighted the great significance of jewelry and accessories. He worked with top jewelry makers, including Kramer of New York, Mitchel Maer, Henkel & Grosse of Pforzeim and Manfred Swarovski. Flower theme has always had its unique place in Dior’s collections, reminding him of his childhood garden. Some of his ironic looks- New Look and flower woman- with full skirts and narrow bodice were inspired by the flowers. 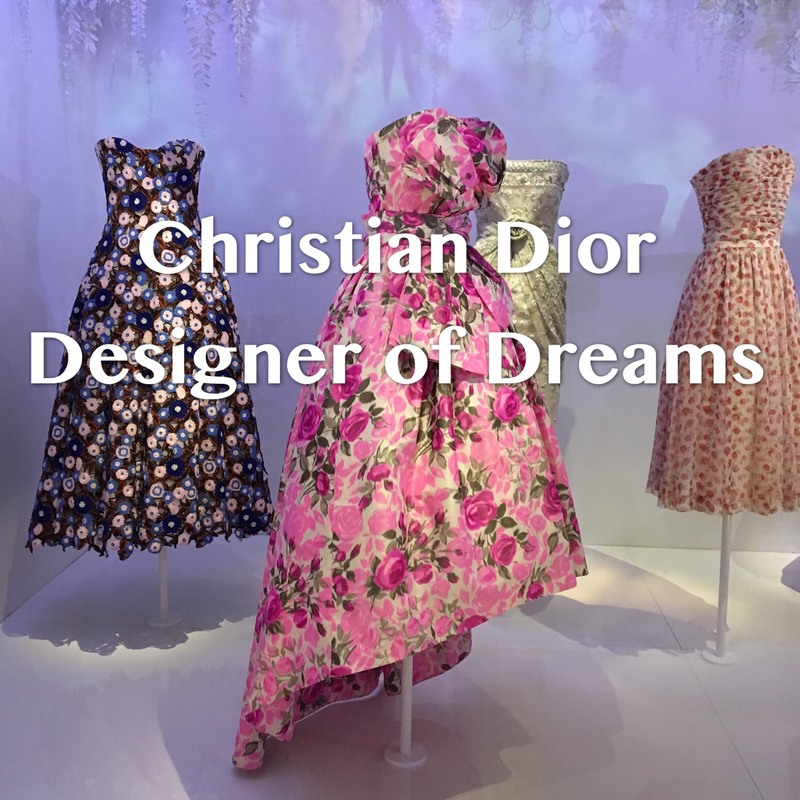 Dior’s dresses were scattered with individual blooms or bouquets, decorated with embroidered meadow flowers or draped in the shape of a rose, like the Opera Bouffe gown. Christian Dior liked to draw the collections in his garden, surrounded by flowers. Marc Bohan, Gianfranco Ferré and John Galliano often adorned their collections with floral embroideries. Raf Simons, for his first Dior show, decorated the runway between the walls with freshly picked flowers. Maria Grazia Chiuri in her first collection for Dior created marvelous embroidered made up of delicate silk, hand-dyed petals by flowers from a herbarium. Christian Dior was one of the most valuable contributors to Parisian haute couture revival after World War II. His output had a tremendous impact not only on French, but also on world’s fashion. For those who would like to visit this magical exhibition, hurry up, as it will be open until the 7th of January 2018. Since there might be a long waiting line in front of the museum, I would advise to order the tickets beforehand online. This was it for this time. I hope you enjoyed the post. Don’t forget to share your opinion in a comment bar below!